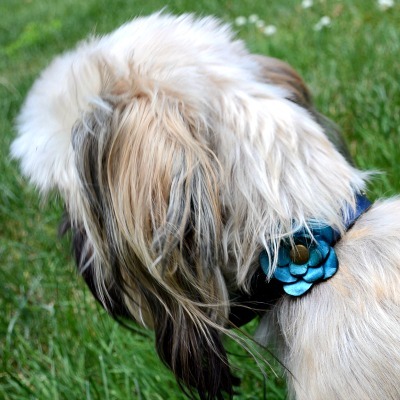 A Leather Dog Collar for Your Small Breed Dog? Call me old fashioned, nostalgic or just yearning for the good old days, but when I found the IQ Leather Dog Collar Company. I admit it was a pleasant surprise to see a bit of Americana that I didn’t know existed in the 21st century. Here is an all American company crafting handmade dog collars and leashes made out of quality leather at an affordable cost the way our ancestors expected them to be. For those of you who may not remember, leather was the standard for products used around animals including dogs. Animal lovers relied on leather long before the invention of some of the newer synthetic fibers that we now assume are the only way to make products, especially collars and leashes for our four legged companions. We may love the feel of real leather shoes or delight in carrying a soft purse handcrafted by a skilled leather crafts worker, but we often forget that our dogs might appreciate the same luxury. I know my own canine children were excited when I opened a package from IQ Leather Dog Collars. I couldn’t tell whether they enjoyed the appearance of the product or simply the smell of real leather, but they all gathered around to see who would be the first to try on the new collar. In our world, man-made synthetics dominates and collars made with nylon and plastic snap locks may not last a year. Leather collars and leashes take me back to a time that few people under the age of 60 remember. Crafted exclusively by a woman-owned company in the High Plains of the United States, one can only envision cattle grazing contently on vast expanses of land where the wind never stops blowing and friendly people never forget their roots. Angie Quintero is the owner and founder, and she is assisted by three special canines, Sawyer, Pixie, and Nala. You don’t have to be 60 years old to appreciate the uniqueness of these products. They aren’t for everyone, but for those who love something special, something surprising unique and eloquent, these collars and leashes may be just what you are looking for. For those who get flustered by the ubiquitous, easy snap, nylon collars that are hard to adjust, difficult to clean and tend to tangle the hair, these collars are for you. Mold to your dog's neck for a comfortable fit. Another thing to consider is that a leather collar will conform to your dog’s neck over time in the same way your leather shoes mold to your feet after wearing them for awhile. I can honestly say I’ve never worn a leather collar, but if it is as comfortable as an old pair of leather shoes, it has to feel good for the dog. 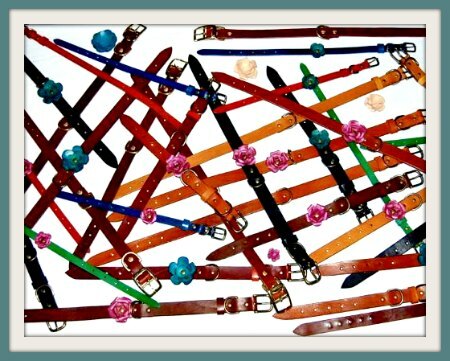 Collars come in a variety of colors from black, blue, brown and green to pink, red and yellow. They are made from 100% vegetable tanned leather and come in sizes that fit tiny toy Chihuahuas to large working breeds such as German Shepherds. You can choose a simple design or one that is adorned with a stunning leather rose either in a complementary or matching color. With a leather collar, your dog's natural skin oils will keep it conditioned for many years. Each collar is carefully hand cut, hand dyed, burnished and hand stitched to give you that one of a kind feels. They are made from thick, heavy duty leather and secured with top quality brass hardware. Collars and leashes are designed to be practical, durable, and stylish, but best of all, they are meant to last a lifetime. Lifetime Warrantee: How is that possible, you might ask? The company has a quick reply with their 100% guarantee. Now, please don’t expect the company to replace a collar that has been chewed in half or shredded by an exuberant, but bored teething puppy. What the company will do is replace the collar if the rivets, D-rings, leather hooks break or if stitching becomes torn. Torn leather straps are also guaranteed as long as the collar has not been damaged due to chewing. No matter what size dog you have, there is a collar that will fit. Sizes range from XXS to XXXL. If you are thinking about purchasing your puppy a new collar, consider their future size. 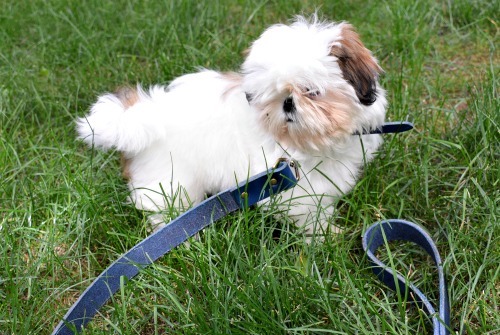 Many small breed dogs can get away with an XXS-S sized collar for the majority of their life. Remember, this is leather, and you could punch another hole if the collar is initially too large. 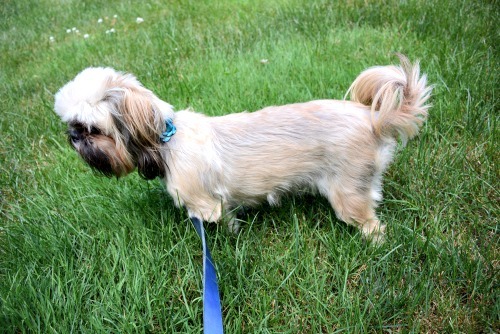 An XXS size fits two of my Shih Tzu dogs that are vastly different in age. Poppy is wearing an XXS Collar, the same one that Hanna is wearing (to the right). Poppy is 10 weeks and Hanna is 5 years old. Hanna is wearing an IQLeather Dog Collar. Very few collars can be purchased that will last a lifetime. When it comes to cleaning your leather collar, Angie, the leather artisan and company owner recommends getting a dry towel or paper towel and wiping off all the grim or soils that might accumulate on the product first. Wipe off any grime or dirt with a dry cloth or paper towel. Use a warm damp towel wrung out well to wipe down the collar. After the collar is thoroughly dry, use a leather conditioner.